Six years ago, Dr Michael Mosley started a health revolution with the 5:2 Fast Diet, telling the world about the incredible power of intermittent fasting. In this book he brings together all the latest science - including a new approach: Time Restricted Eating - to create an easy-to-follow programme. 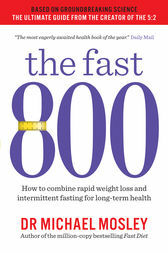 Recent studies have shown that 800 calories is the magic number when it comes to successful dieting - it’s an amount high enough to be manageable but low enough to speed weight loss and trigger a range of desirable metabolic changes.